Are you hiring? Get in Touch! 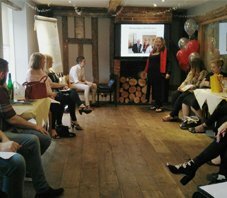 Red Recruit held their very first annual conference on Friday the 5th of August, in the picturesque market town, Maldon. The conference was led by talks from key figures in the company and an independent speaker, collectively covering the past, present and the bright future of the company. The Red Team's achievements were celebrated by Caroline Seear, CEO and Simon Johns, Managing Director praising the exceptional performances with Certificates of Honour and Champagne. Opening the conference, CEO, Caroline Seear wearing her signature dash of red, sequentially told from the creator's point of view, the story of Red. Rich in photographs and vibrant with tales of success, we were told how the original foundations of Red were built and why, the first sale accompanied by the first check that still hangs proudly on the wall today and the progression from the earliest home office to the current multi floored office. Caroline's talk lead the audience to see the natural need for change, by exposing the positive successes of change in the past and with fluidity, the audience's attention was guided to the future and energised at the potential of the company and of themselves. 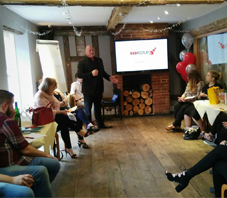 Now with the clear vision of where Red Recruit has been and where it is going, Managing Director, Simon Johns and his clear cut, bouncy talk gave a curvaceous insight into the present and future position of Red. Simon walked the audience through fundamental strategies, timelines and updates whilst keeping up an excited, engaged atmosphere. Simon developed the growing sense of staff appreciation Caroline had previously established, and their acknowledgements of the sheer team work and leadership that have powered the engine of Red so far, were proudly noticed by the team. Simon and Caroline sitting down, Ayo proceeded in getting everyone together in the spirit of bonding, with a drink in hand and a LinkedIn recommendation writing session, with a bubbly feeling amongst the audience and inspiration throughout the room colleagues wrote recommendations for each other. Think about it. Who knows you better professionally than your own colleagues at work? Their recommendations being the most revealing of your professional self. There is a sense of worth created for the one written about, and for the one doing the writing, a strong sense of introspective connection. Which works together to create great team bonding for all concerned. This launched the new phase of Red in which every voice shall be heard, and the desired transformation will be based on everyone’s. Throughout the talks our audience were well feed and hydrated, we guarantee no one suffered from boredom during our conference and once the key points were made everyone participated in a well-deserved toast. What does a Recruiter actually do? Registered in England and Wales No: 4483146.